Sonic Adventure Kiss >> Do not get caught! See how long you can smooch with your girlfriend before anyone catches you. If you get caught, it will be very embarrassing and you will lose a life. You only get 3 tries so be careful. Kissing for a long time will earn you points and fill the meter so long as you do not get caught! Just before the characters will look at you, they will give you a little hint that they are about to look. Be perceptive! Sonic has lost his shoes in the Desert Oasis. Race against time, genies, and spikes as you try to get his shoes back! Choose from multiple backgrounds and tons of doodads including oversized Sonic, Tails, Knuckles, and Robots. This is the very first Sonic RPG episode. Starring: Sonic, Chaos, Dr. Robotnik, Knux, and Shadow. 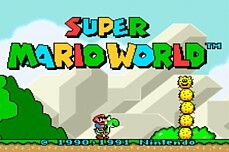 Explore the vast world of Super Mario 2 in this snes-like rendition of the classic Super Mario World. Expertly done! In the second part of the very first Sonic RPG episode, our hero Sonic does battle with Eggman's Robot. Navigate the maze to reach the house in the center as quickly as possible. If you run into a dog, you are dead meat! This is the 8th Episode of the Sonic RPG series. Can Sonic and Shadow defeat the dark hedgehog known as Seelkadoom?